Sometimes I am a slow learner. Not always, but sometimes. I have been learning how to use WordPress since I started blogging last May. One of the reasons I started the blog was so that I could learn how to do it. While searching the internet, I found numerous blogs that are great to read – entertaining or educational or humorous or all of the above. I figured it would be fun to give it a whirl. First I had to think of something to write about – it started out slowly and rather sporadically. Almost immediately I realized that I had to add some photos to add interest, besides I love taking pictures and what better way to share them? (Never quite got the hang of online photo galleries, except for .Mac gallery, which shuts down in June.) So – I read and played and figured out inserting photos. The method I use to insert photos is slow and tedious, but that just means there’s room for improvement, right? This is me taking a break in a supported shoulder stand. I’m not sure which yoga pose the cat is doing. I also decided I should try to post on some sort of schedule. This would give me a regular deadline (and who doesn’t work better with a good deadline?). Twice a week. That seemed reasonable, and so far, it has been. Which brings me to the point of this post. I FINALLY figured out how to put a break in the post so that you could hit something to read the whole thing! I’m pretty darn excited about this. Now of course my problem is deciding where to put that break. If I put it in too early, maybe I won’t have caught your attention and you’ll just go visit some other site. Of it I put it in too late, it may be anticlimactic as I may have already said everything that needed to be said. And how about photos? What if I put all the photos after the break? Will anyone even see them? You can see how confused I am. 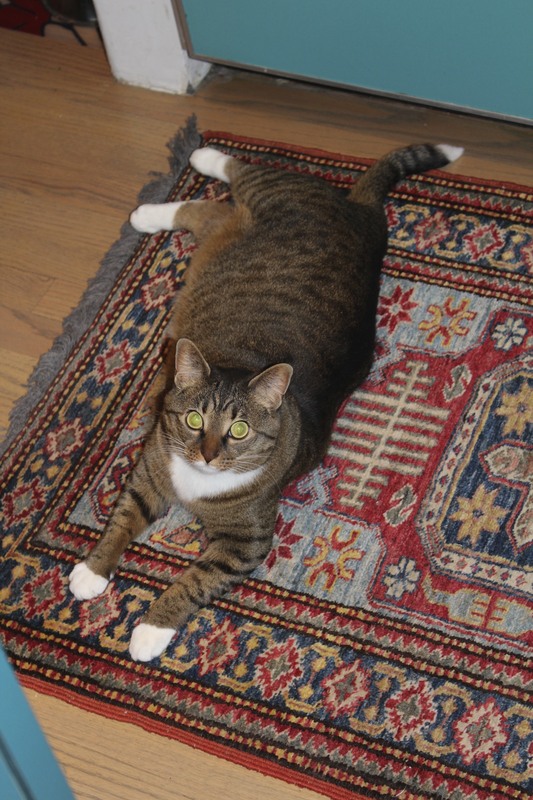 This is a picture of my son, Marc’s cat – Kush. Kush doesn’t get stressed or confused very easily. Well – I’m posting this with my first “read more” button. I can’t see what it looks like until it is posted, as it won’t show in th preview mode. How to make me nervous, WordPress! Then I wonder, is it okay to go to earlier posts and put the break in so that when people look at the home page they don’t have to scroll forever to get to the bottom of the page. So many details to deal with! I’m sure there’s an easy way to do this, but as usual it will probably take me a few months to figure it out. The good news is that once I do figure it out – I’ve got it! Wish me luck. 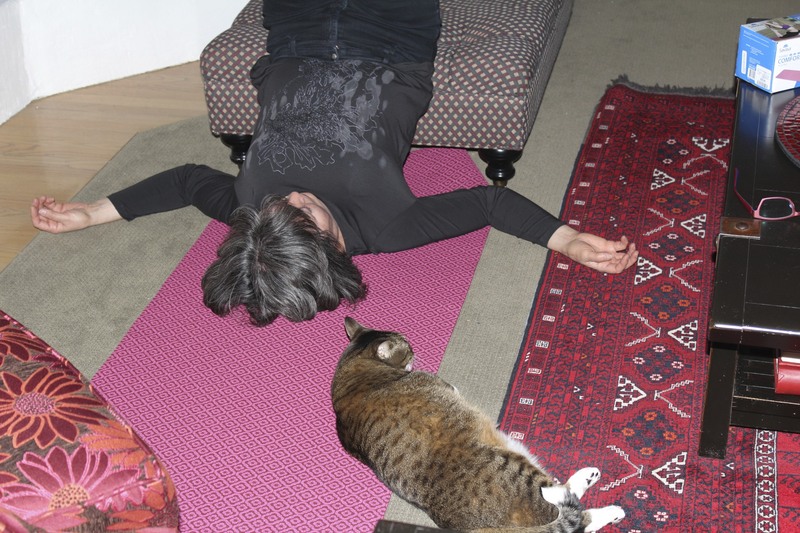 Love the yoga pose with the cat – I think my dogs are tring to learn too! That cat definitely has some moves that I will never be able to do, but she seems to have trouble with upward facing dog. You are inspiring me Terri – I love your timeline and goal of two posts a week. Well done meeting that goal. The learning curve is something that we should all be experiencing in some part of our life or another. When the learning stops I think it will be time for real concern. Don’t think that you are anywhere near that point – so enjoy the curve….. Thanks Catherine! I’ll keep on learning – I’d like to “know it all”!